After the Canadian Pacific Railway Bill was voted through the House of Commons in February 1881 the Canadian Pacific Railway Company was formed. They agreed to build the railway in exchange for $25,000,000 in credit from the Canadian government and a grant of 25,000,000 acres (100,000 km2) of land. The government transferred to the new company those sections of the railway it had constructed under government ownership. The government also defrayed surveying costs and exempted the railway from property taxes for 20 years. In 1884 the Canadian Pacific Railway Co. entered into ship owning and three steamers were built to operate Great Lakes services. 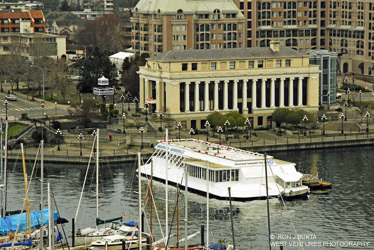 Once the railway was completed to British Columbia the C. P. R. first chartered, then soon bought their own steamships. These sleek steamships were of the latest design and christened with the prefix Empress in a link to the Orient. 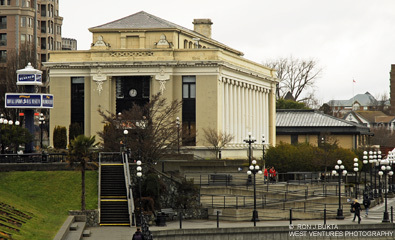 A Vancouver – Victoria service started in 1897 and in 1901 the ships and coastal services of the Canadian Pacific Navigation Co. were acquired. The company had a practical role in transporting immigrants from much of Europe to Canada. They also played an important role in both world wars with many of them being lost to enemy action including the Empress of Britain. Service on the BC coast included the Vancouver-Victoria-Seattle Triangle Route, Gulf Islands, Powell River, as well as Vancouver-Alaska service. British Columbia Coastal Steamships operated a fleet of 14 passenger ships made up of a number of Princess ships, pocket versions of the famous ocean going Empress ships along with a freighter, three tugs and five rail car barges. Popular with tourists, the Princess ships were famous in their own right especially the Princess Marguerite (II) which became the last coastal liner operating from 1949 until 1985. In 1905, Francis Mawson Rattenbury built the first wooden terminal for the company. That is what we see in the 1907 video. Later, in 1923, this would be replaced by what is considered to be Victoria’s best example of Neoclassical Revival architecture, designed by Rattenbury in partnership with Percy Leonard James. Constructed of precast concrete, the new building is a temple to maritime commerce with intricate carvings. Generations of Victorians travelled via C. P. R. Princess Ships through this terminal. In 1963, the C. P. R. moved its head office to Vancouver and this site was purchased by the Provincial Capital Commission. The Royal London Wax Museum moved into the main floor in 1971 and remained there until 2010.